The pod was trying to access the area where 416 pilot whales were stranded overnight. RESCUERS DEFIED A shark threat to form a human chain in a New Zealand bay in a bid to keep another 200 whales from becoming stranded a day after hundreds died in a mass beaching. About 150 people waded out up to their necks at Farewell Spit in the northwest of the South Island to form the human wall as they also guided some 100 survivors from Friday’s beaching away from the shore. Environmental group, Project Jonah, which is assisting with the rescue mission, described the new arrivals as “a super pod” which “swam into the bay and within 20 metres of the human chain. “This pod joined up with the refloated whales of which almost 100 joined the larger pod,” the organisation said in a statement. Andrew Lamason, regional operations manager for the Department of Conservation (DOC) told AFP the focus was on preventing the whales from reaching a beach already littered with more than 300 dead whales. The pod was trying to access the area where 416 pilot whales were stranded overnight on Thursday, with about 70% already dead when they were found on Friday morning. Lamason said they needed to have the survivors far away from the shore before the evening low tide. “They are moving along the spit. They are still in shallow water and we have three boats out there trying to turn them,” he said. DOC ranger Mike Ogle told Radio New Zealand the whales could have been frightened into the shallows by a shark. One whale had been found with bite wounds and great white sharks were known to be in the area off Farewell Spit, he said. Hundreds of volunteers mobilised to help the rescue operation with many working to comfort the stranded animals and keep them cool in the morning heat while they waited to refloat them on the high tide. Tim Cuff, a marine mammal medic with Project Jonah, told the New Zealand Herald of emotional scenes over the mass deaths. “It’s a pretty sad scene up on the beach where there’s a long line of dead whales,” he said. DOC officials said the carcasses would either be tethered and towed out to sea, or left to decompose in the sand dunes. Farewell Spit, about 150 kilometres west of the tourist town of Nelson, is notorious for whale strandings and has witnessed at least nine mass beachings in the past decade. “If you designed something to catch whales then Golden Bay is probably the perfect design,” Lamason said. Pilot whales grow up to six metres (20 feet) long and are the most common species of whale in New Zealand waters. Email “Swimmers defy shark ban and form human chain to save 200 whales”. 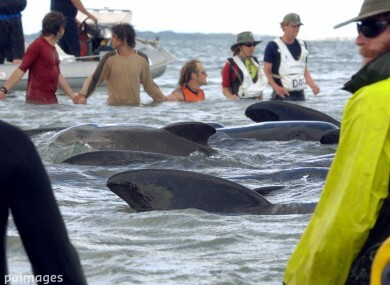 Feedback on “Swimmers defy shark ban and form human chain to save 200 whales”.